Today is my final posting as a Guest Designer for March for the Color Combo Challenge Team. I have had fun the past month, creating cards with fabulous colors choosen by the Challenge Hostesses. This week's colors were picked by Vicki Dutchr (Elegant Eggplant, Concord Crush and Melon Mambo). And the dessert (optional) this week is Stripes! I don't have Concord Crush, so I tried adding VersaMark to my Elegant Eggplant to intensify the color, hoping it would be close to the Concord Crush, but there was only a subtle color difference ... so I used the two different purples I have (Elegant Eggplant and Perfect Plum) along with the Melon Mambo. Very bright and intense colors - and a lot of fun to work with. I made two cards, hope you like. I inked the Simply Soft stamp with Stampin' Write markers Elegant Eggplant and Old Olive, stamped onto the Whisper White cardfront and quickly embossed with clear using my heat tool. I added Tombow glue to the "flower heads" and covered them with Flower soft. Once dry, I added a small piece of hot pink ribbon with a half knot. I cut a strip of the striped Elegant Eggplant DP, stamped the sentiment in VersaMark and quickly embossed with white using my heat tool. I mounted the strip onto the card front. I mounted the card front onto a card base of Elegant Eggplant. I used the Bordering on Romance stamp set for the second card I made for this week's color challenge --- first time using my new set! I used the marker layering technique (tutorial is on SCS website). Hope you like. I stamped the flowers in StazOn ink onto watercolor paper. Using the Marker Layering Technique, I added Perfect Plum and Elegant Eggplant inks to the large flowers, spreading the ink with the blender pen. I repeated the same technique to color in the rest of the flowers and leaves. I cut the main panel to size, mounted onto a thin frame of Elegant Eggplant cardstock and then mounted the framed image onto a larger frame of Perfect Plum, popping up with dimensionals to add depth. I ran a large piece of Elegant Eggplant cardstock through my Big Shot with the Textile embossing folder, which had been inked on the inside with VersaMark (faux letterpress technique). 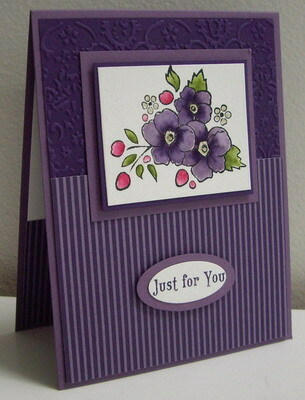 I mounted the embossed panel onto a card base of Perfect Plum. 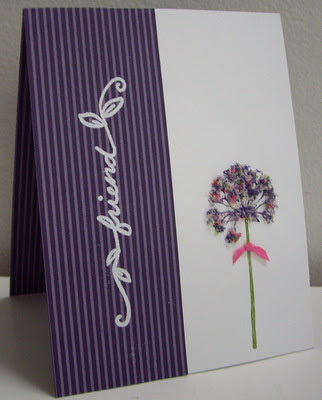 I added a 3" piece of Elegant Eggplant striped DP on top fo the embossed card front. I mounted the main panel on top, popping it up with dimensionals to add depth. I stamped the sentiment in Elegant Eggplant ink onto watercolor paper, punched out the small oval, and then mounted it onto a medium oval of Perfect Plum cardstock. I added the sentiment to the front of the card, popping it up with dimensionals for more depth. I really like them both, but I love the second one - the colours of the flowers are just gorgeous, and so nicely bordered and popped up! Love this card! The rich purple colors, the flower... all so gorgeous.